Great, Fabulous, have all the new technology. The laser procedure was painless and quick. Pretty awesome. *After booking your appointment with Dr. Aristodemo, please call (847) 854-0525 to confirm. If we don't hear back within 24 hours of the booking, your appointment will be cancelled. Thank you! 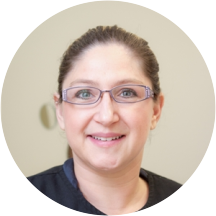 * Relationship Dentistry is alive and well at Aristo Dental and The Center for Facial Esthetics, Nutrition and Wellness. In dentistry, there is a saying: “You should never treat a stranger.” Part of the reason I chose dentistry is due to the great relationships I am able to form with so many different people. I feel so fortunate that I am in a position where I can meet and befriend so many different people from all walks of life. Everyone comes with so many different stories and experiences. I so enjoy talking to all of you. And if you are already a patient here, you surely know that! Academically, I graduated from the University of Illinois Champaign-Urbana in 1995, where I majored in Biology. Immediately afterwards, I started Dental School at the University of Illinois - Chicago. I graduated in 1999. It’s hard not to get too personal at Aristo Dental. I practice with my husband, Giovanni, and it is very likely you will feel the family environment. In addition, we have a great relationship with our team members; they are merely an extension of our own family. Speaking of family, Giovanni & I have three great children. Jonah who is eight, Ariana - five and Lily - two years. Needless to say that is where I spend all my free time! If I had more energy and more hours in the day, I enjoy biking, hiking and doing yoga. I love to read and knit- thanks to a wonderful patient who made an appointment with me just to teach me the basics! I have training in Reiki-I and Reflexology.